Panasonic continues to expand the lens range for its Micro-Four-Thirds cameras with this new 60mm-equivalent model aimed at normal day-to-day shooting and close-ups. As a follow-up to the Leica-branded 45mm (90mm equivalent), this shorter macro lens has arguably greater all-around appeal. It adopts 9 elements in total in 9 groups and has one element with an aspherical surface to reduce chromatic aberration and distortion, as well as a built-in stabilizer unit to minimize blurring when hand-held. However, Panasonic don’t make any claims as to the effectiveness of the stabilizer. Autofocus is achieved using a stepper-type motor and focus is both smooth and quiet. Similarly-equipped cameras also use Panasonic’s 240 fps-drive AF technology, which is said to improve drive response. The macro design provides a maximum 1:1 magnification at just 4.1 inches (10.5 cm), although the lens doesn’t extend due to adopting an internal focus mechanism. The lens measures 2.31 x 2.50” (58.8 x 63.5mm) and weighs 6.35 oz (180g). It is available now at around $399 (USD). With a DxO Mark lens score of 17 points on the Panasonic Lumix GH-3 (we’ve yet to test the lens on the GH-4), the 30mm is a good performer, with low vignetting and very low lateral chromatic aberration. Sharpness and uniformity across the field is good, although inevitably, the lens is less sharp at the borders than at the center at maximum aperture. Sharpness improves on stopping down to f/4, where it reaches optimum performance. It has similar performance at f/5.6, although in the lab it is not quite as sharp centrally, and at f/8 the effects of diffraction on sharpness are quite noticeable. Pincushion distortion is quite high for a lens like this, though that may be corrected in-camera to a degree on certain models. 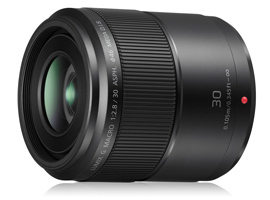 In terms of ranking, the 30mm Macro is one of the best-performing models in the lineup. Performance is on a similar level overall to that of the maker’s Leica-branded 45mm, and to the Olympus 60mm F2.8, though that shouldn’t be too surprising, given the focal length. As for sharpness, the 30mm is slightly sharper between the maximum aperture and f/4 than the Leica model (but on par with the Olympus), which is arguably more important in a normal lens and less so as a macro. By f/5.6, however, there isn’t much between them, though the Leica isn’t quite up to the 30mm or the Olympus in the outer field, at least in the lab. 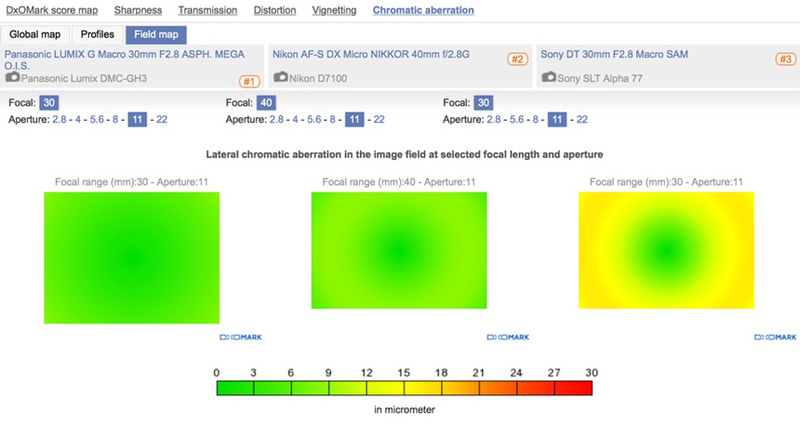 All three exhibit good control of lateral chromatic aberration, though the 30mm is free of the doughnut-shaped ring that’s visible with the Leica and to a lesser extent with the Olympus. There are some weak areas in comparison, though. The 30mm has slightly more noticeable vignetting and distortion, though neither are that difficult to overcome. The Panasonic 30mm has excellent control of lateral chromatic aberration. 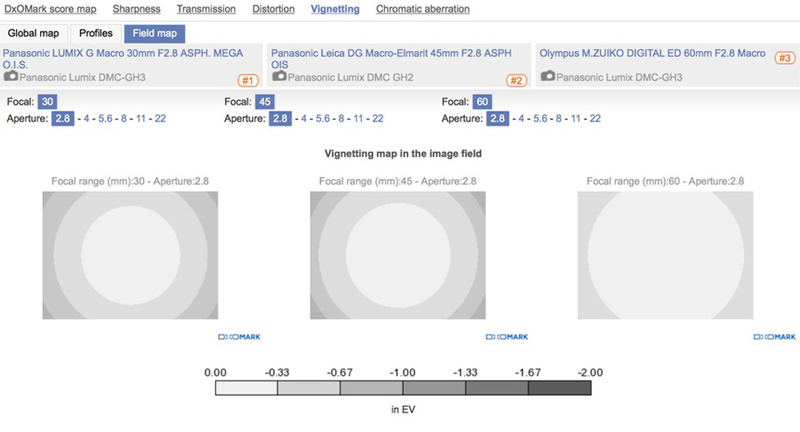 Vignetting is similar to the Leica but more noticeable, especially when compared with the Olympus. 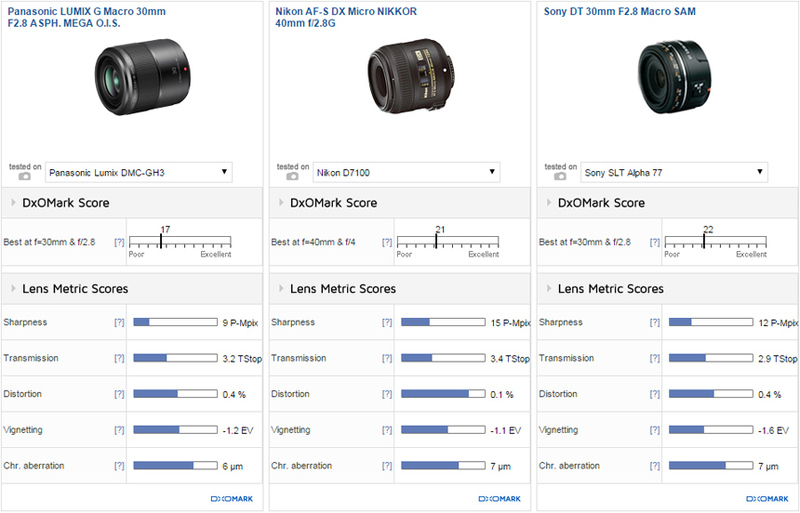 Macro lenses with short focal lengths for APS-C format models aren’t numerous, but Nikon makes the AF-S DX Micro Nikkor 40mm, a 60mm-equivalent f/2.8G, and Sony offers the slightly shorter DT 30mm (45mm equivalent) f/2.8 Macro SAM. Both models are more accessibly-priced, though in fairness, the build of the Panasonic is superior, and the lens, in general terms, is aimed at a slightly more discerning market. 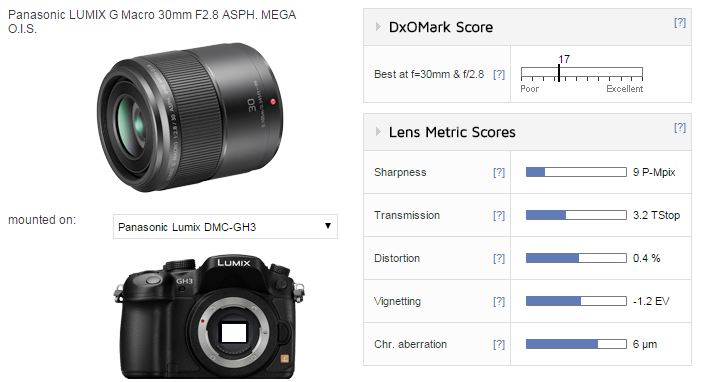 Given the higher-resolution sensors of the Nikon D7100 and Sony SLT-A77, peak sharpness levels are lower on the Panasonic combination, accounting for a lower DxOMark score overall. However, at the initial aperture, the Panasonic is already close in sharpness, and so it looks promising for higher-resolution bodies. Uniformity of sharpness across the field of the Panasonic almost rivals that of the Nikon; the Sony is sharp centrally, but has relatively poor uniformity for a lens like this. The Sony also has higher vignetting but similar levels of distortion, whereas the transmission of the Nikkor is disappointing. The Panasonic also impresses with its correction of lateral chromatic aberration. 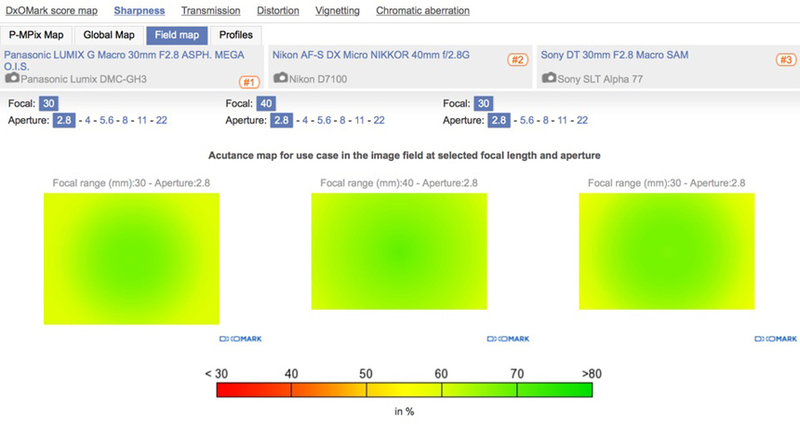 Both the Nikkor and he Sony have equally low levels, but the Panasonic has superior correction across the image field (and is less likely to reveal itself in certain positions). 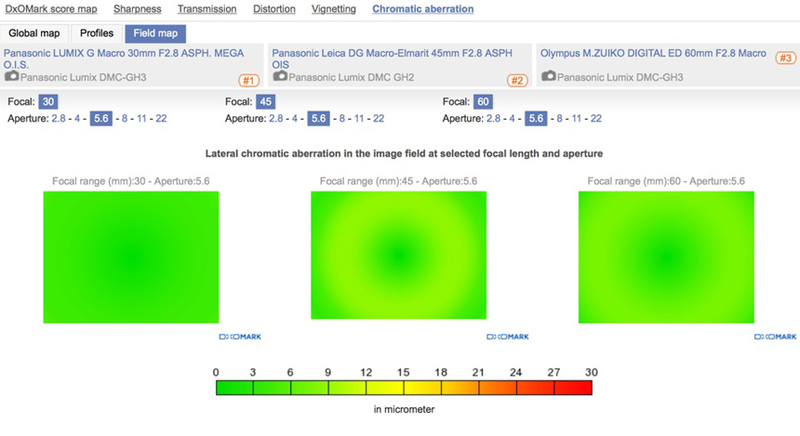 All three models exhibit low lateral chromatic aberration, but the Panasonic is the best-corrected across the image field. 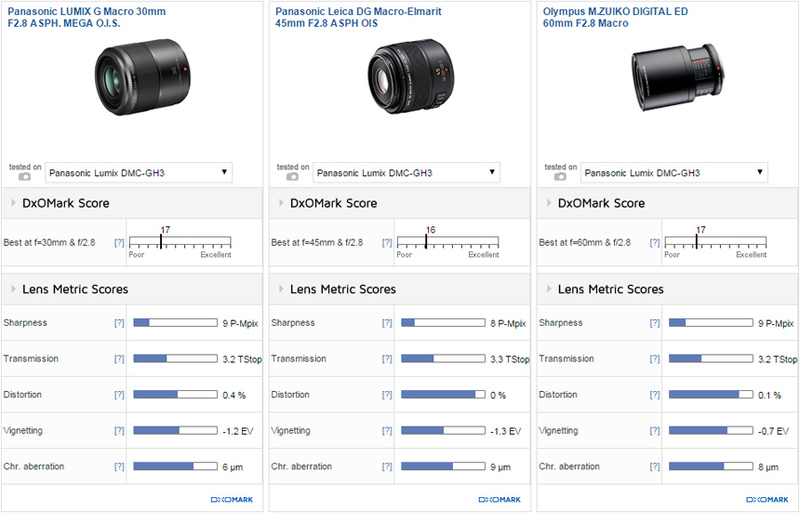 Overall optical performance of the Panasonic is very good, with the somewhat low-ish DxOMark score attributable to the lack of higher-resolution camera models available for testing. Be that as it may, the Panasonic 30mm f2.8 Macro looks promising. 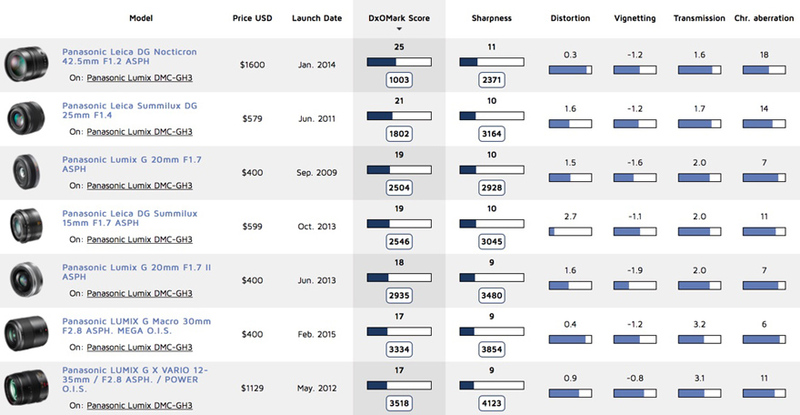 Given the build quality and specs, the slight premium isn’t at odds with rival offerings. While it’s a welcome addition to the lineup and an attractive option to the starter-type kit zooms and high-speed normal models, lenses like this remain a somewhat niche market today.